I still have a bunch of white and pink kekwa I bought for the DIY gubahan hantaran magazine photo shoot. I thought about making a more elaborate sirih junjung from the leftover of crysthanamum. The lower part which I have arranged the betel leaves (daun sireh) was the same one I used for the photo shoot. I found the white IKEA pot in my craft room and put it in the middle of the sireh arrangement. I couldn’t find spaghnum moss to cover the top part of the florist sponge so I have to use some artificial fillers. 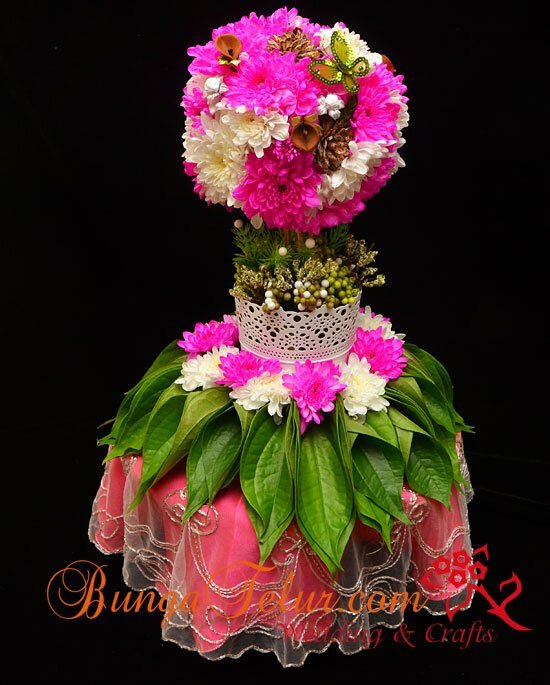 For the topiary I added more pink and white kekwa to cover the bottom part of the florist sponge. It was quite a challenge for me to make sure that it looks like a ball..haha! I still make sure that I use bunga pinang, bunga kapur and gambir in the sirih junjung arrangement. It doesn’t matter what kind of style your sirih junjung might be, but the essential must be included. Otherwise it won’t be a sireh junjung, rather a floral arrangement with sireh leaves. Oh, for this particular style of sirih junjung, I only used about 50 sirih leaves, 2 stalks of pink kekwa and 1 stalk of white kekwa. I did this for a bridal magazine photo shoot next week. 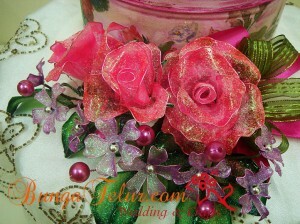 This is one of the 4 DIY gubahan hantaran that I have to do for the photo shoot. I’ve never done bunga dip in shocking pink and purple so I thought this will be a good time to experiment. After all I no longer take custom made order for bunga dulang so chances like photo shoot or class sample are the time for me to try something new. 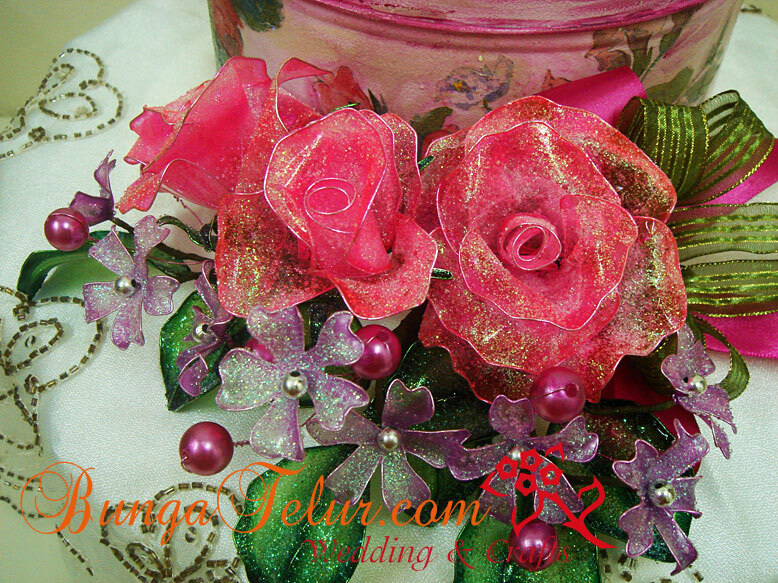 A few months ago I did the basic petals in shocking pink because I wanted to make a hand bouquet. It didn’t materialize because I was demotivated..huhu! So I decided to add on more petals and assembled them into roses, later this can be used as sample for my bunga dip class. 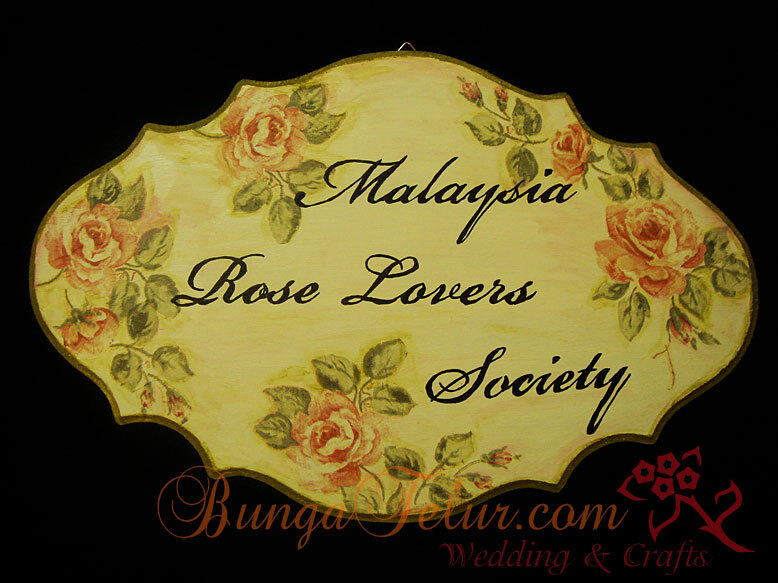 Bunga dip class for 17 June, 2-5pm is still available. 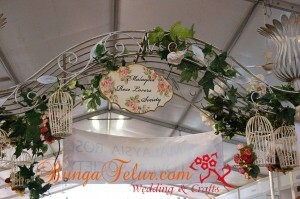 If you are interested to make your own bunga dulang and bunga telur for wedding or engagement, join the class. The fee is RM100. Please contact via the phone number in the announcement box above or email me. I recently joined Malaysia Rose Lovers Society since I have started gardening again early this year. Their first event was to launch the society to public by opening a booth during Hari Belia Negara 2012 in Putrajaya. I made this plaque with the society name on MDF board as a demo for the event. It was a brief session in which I showed to those who stop by at the stage on how to do decoupage on board like this. Later after the demo session was over, I handed the plaque to one of the society committee. They put this up at the flower arch. Nice, right? For those interested to learn on how to make a basic decoupage item like this, you are invited to join my class on 10th June, Sunday 3-5pm. The fee for the class is RM60 inclusive of materials needed for class. You can always bring home the completed decoupage item. For the class, you can choose either ceramic plate or wooden frame with mirror from IKEA. Please leave comment or contact me via SMS if you are interested to join the coming class.